Artist's rendition of magnetic reconnection triggering substorm onset, as captured by NASA/THEMIS spacecraft. A flotilla of NASA probes has tracked the origin of speedy particles in Earth's atmosphere and confirmed that, after they are spawned by "substorms" in Earth's magnetic field, they gain energy as they rocket toward Earth. 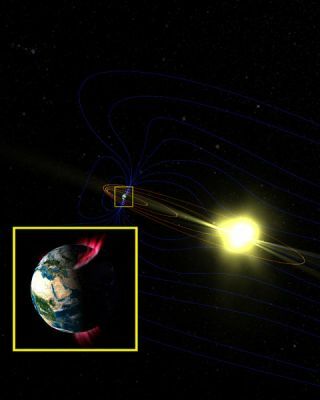 Understanding the source of such particles and how they move is crucial to gaining a better knowledge of space weather around our planet, which can affect satellite communications and endanger the health of astronauts, researchers said. "The origin of fast electrons in substorms has been a puzzle," lead author Maha Ashour-Abdalla of UCLA said in a statement. "It hasn't been clear until now if they got their burst of speed in the middle of the storm or from some place further away." Substorms originate on Earth's "night side" opposite the sun, at a point about a third of the distance to the moon. Here energy and particles from the solar wind collect over time, and can be released in magnetic explosions that send particles speeding off into space. These high-energy particles zoom down the Earth's magnetic field lines until they collide with the planet's upper atmosphere to create dazzling, shifting colors in the auroras — the northern and southern lights. Scientists have wondered for decades how these particles achieve their fantastic speeds. In the early 1980s, researchers theorized that the particles might ramp up to higher and higher energies as they crossed changing magnetic field lines — a process known as betatron acceleration. But in the absence of observations across broad swaths of near-Earth space, this hypothesis was hard to test. "For 30 years, one of the questions about the magnetic environment around Earth has been: How do magnetic fields give rise to moving, energetic particles?" said study co-author Melvyn Goldstein, chief of the Geospace Physics Laboratory at NASA's Goddard Space Flight Center in Greenbelt, Md. THEMIS, with its five widely spaced probes, provided a good tool for investigating this problem. Three of the THEMIS spacecraft traveled through a large substorm on Feb. 15, 2008, enabling scientists to track changes in particle energy over a large distance, researchers said. The researchers examined the THEMIS observations and devised computer models that simulated how substorm-generated particles should move through near-Earth space. The models predicted that the electrons would gain lots of speed as they moved toward Earth and crossed many changing magnetic field lines. In their study, reported online Jan. 30 in the journal Nature Physics, the researchers report that the THEMIS data supported those predictions down to the details, suggesting the beta acceleration hypothesis is on the money. "This research shows the great science that can be accomplished when modelers, theorists and observationalists join forces," said Larry Kepko, a THEMIS deputy project scientist at Goddard. "THEMIS continues to yield critical insights into the dynamic processes that produce the space weather that affects Earth." NASA launched its $200 million THEMIS spacecraft (short for "Time History of Events and Macroscale Interaction During Substorms") in February 2007 to study the formation of substorms. Two of the satellites are in the process of moving to a new orbit around the moon. They have been renamed ARTEMIS and are due to achieve their planned path in July 2011. The three other satellites will continue to study substorms, researchers said.